Pallet-based modular conveyors used in flexible manufacturing provide a wealth of benefits in just about any assembly operation. Suitable for applications ranging from small electronic parts assembly to large appliance manufacturing, automotive drive train and even medical device assembly, these conveyors help improve production, achieve higher product quality and enhance manufacturing flexibility. And with different choices for conveying media including belt, flat-top chain or roller chain, there are plenty of configurations available depending on the application. While most OEMs and end users expect their pallet-based conveyor systems to be durably designed and destined for a lengthy service life, longevity and superior efficiency can only be achieved through proper conveyor maintenance. Failure to properly maintain industrial conveyors can greatly reduce the system’s life and produce unexpected and costly downtime. Although it may seem inconvenient to regularly check for potential problems, it’s a better alternative to schedule limited downtime for routine maintenance rather than face an untimely and catastrophic problem where an entire assembly line may go down. Even though maintenance schedules can certainly vary according to the complexity of the conveyor system, there are several things that can, and should, be done on a regular basis to ensure proper functionality of modular assembly conveyor systems. Daily Maintenance Checks It may sound like common sense, but daily maintenance is often overlooked. On a daily basis, inspect and remove any small parts and debris that may accumulate on conveyor belts and chains. Examine belts and chains for any visible wear, damage or separation. If there are any visibly damaged belts, chains or associated guides, replace them immediately. Another factor contributing to the performance and longevity of the conveyor system is the system’s overall cleanliness. As a result, conveyor systems should be wiped down once a week and all grease and dirt should be removed from the conveyor and corresponding modules. Next, inspect the bottom of the pallets for debris that may become embedded. Fasteners from the products being assembled have a nasty way of sticking where they’re not supposed to. Also, check T-bolts on the pallet stop gates and re-tighten them if they are loose. If a stop gate is skewed, it could indicate a fastener is loose. Also, inspect and, if necessary, lubricate flat-top or roller chains, sprockets and corresponding guides. Make certain chain tensioners are in the acceptable tension range, because chains will stretch over time. Some companies make it extremely easy to check the tension range. Rexroth drive units, for example, feature a special chain indicator slot through which a pin clearly indicates the location of the tensioner. In addition to daily and weekly maintenance procedures, there are several monthly actions you can implement to extend the life of the conveyors. On a monthly basis, lubricate toothed belts on conveyors with light-grade oil. Also, check for loose or missing fasteners and tighten or replace them as needed. Side guards on drive and return units are also locations where debris can accumulate, so it’s imperative that these components be removed once a month and cleaned. Small parts can fall and get caught between the belt and guide profile and these falling parts can do tremendous damage to the belt, guide profiles, drives or returns. It’s also essential to make certain all cooling components are running efficiently, because heat leads to increased wear, poor system performance and premature belt failure. To ensure the best possible performance, wipe any dirt or grime from the fan shrouds of all motors to maintain proper motor cooling. Through heavy use, fasteners from the conveyor can also become loose in other key areas, such as on the conveyor’s foundation. Therefore, check for any loose or missing fasteners on the structure itself once a month. On a quarterly basis, maintenance technicians should inspect the condition of the conveyor chain for stretching, wear and correct lubrication. As a chain expands, the chain and corresponding drive sprockets wear in unison. But because the sprockets will reach the end of their life cycle and be replaced before the chain, the new sprockets will stretch the chain at a faster pace due to the disagreement in pitch length. Proper lubrication of flat-top and roller chain conveyor chains has been found to greatly prolong satisfactory system performance. Skipping lubrication intervals can result in a malfunction or even a failure of the chain or a crash of the system. 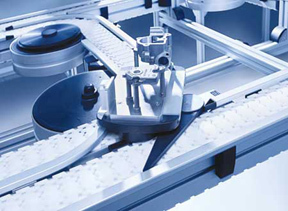 Some conveyor manufacturers such as Bosch Rexroth offer automatic lubrication modules and refill cartridge units with drivespecific adapter sets that ensure optimum lubrication directly at the chain links. The module’s continuous operation provides clean and precise lubrication just where it’s needed. The lubrication cartridges are easy to replace when empty, thereby saving time on maintenance as well. In some cases, automatic lubrication units can even be retrofitted to existing conveyors. In addition to the above-mentioned advice, it’s also recommended that companies utilize maintenance training for their conveyor systems, as well as tune-up and consultation services available from most reputable conveyor suppliers. For example, some companies like Bosch Rexroth offer professional conveyor service where a maintenance expert will visit your facility, inspect the conveyor in motion and provide recommendations and solutions to keep the conveyor running efficiently. 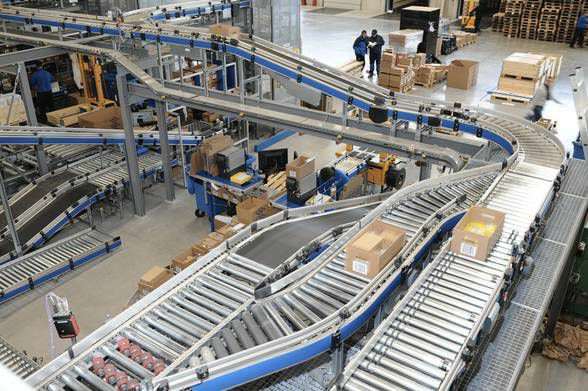 Ultimately, by taking a few minutes regularly to keep your conveyor system in pristine condition, you can save a lot of time, money and hassle in the future.